Data can be entered on many websites without further configuration. The website is scanned in order to find data entry fields in which the user name and password can then be entered. No further steps are thus necessary. For websites where data cannot be entered directly, it is necessary to create an application manually. These applications correspond to working guidelines that precisely define which information should be entered into which target field. The full script that describes the assignment is called an “application”. The diagram starts with the user navigating to a website. The application server is then checked (via the add-on and the SSO agent) to see whether a record has been saved for this website for which the currently registered user also has the required permissions. 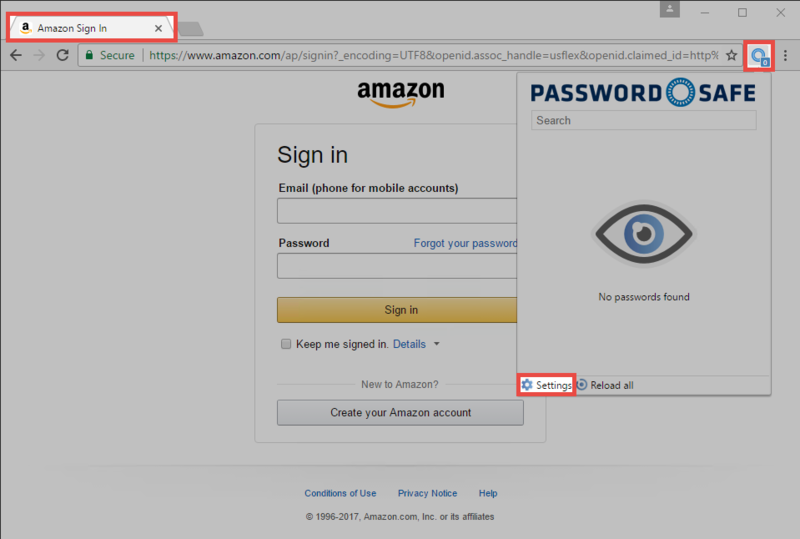 If this is the case, the information required for the login is sent to the browser add-on in encrypted form. The password is only decrypted in the add-on shortly before it is entered. There are two ways in which the information is entered: Data entry without application and Data entry with application. The data entry without application process is sufficient for most websites because the fields can be directly assigned (mapping). The system checks in the background whether a login mask has been found for any websites visited. The URL is now used to check if there are any records in the linked websites that would fit the page. It is only necessary for the hostname including the domain suffix, such as .de or .com, to match. If the registered user also has the required permissions for this record, the data will now be requested by the SSO agent. 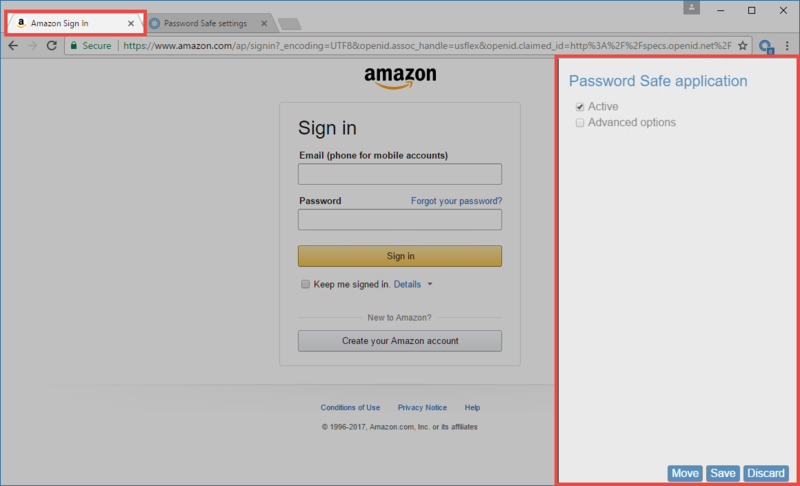 Important: Up to this point, the add-on has no knowledge of passwords!. The data are then entered. In this case, the user name is transmitted to the first user name field that can be found on the page. The password is also entered into the first password field found on the page. 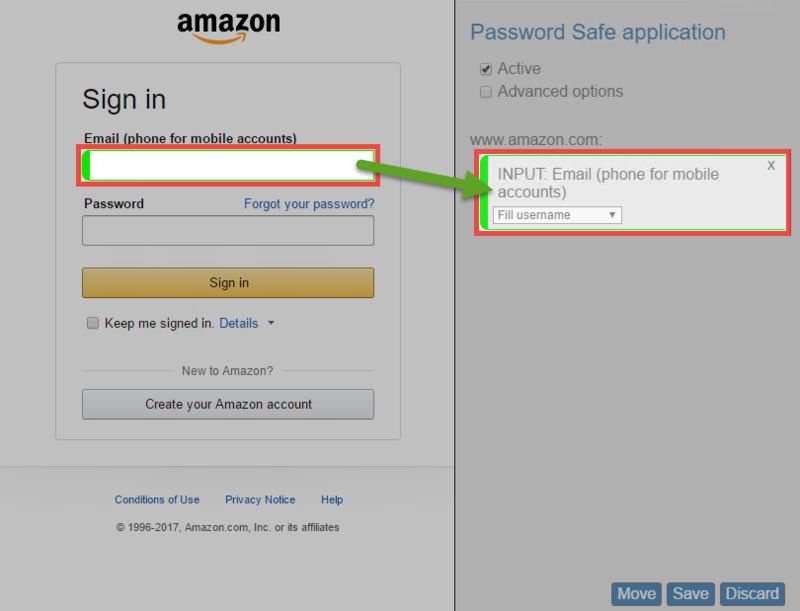 If automatic login has been activated in the settings, this is also carried out by clicking the login button. It is not possible to automatically recognise the fields that must be filled on some websites. An application needs to be created in these cases. If more than two fields need to be transferred, it is also necessary to create an application. In this context, “application” means instructions that are used to enter information into the fields. It thus assigns fields in the record to the associated fields on the website. This mapping process only needs to be configured once. The applications is responsible for entering data in the fields on the website from then on. In the following example, the data entry process is carried out from the client. Naturally, this is also possible via browser add-ons. The procedure remains the same. The URL is checked to see whether the record matches the web page. It is only necessary for the hostname including the domain suffix (“.de” or “.com”) to match. 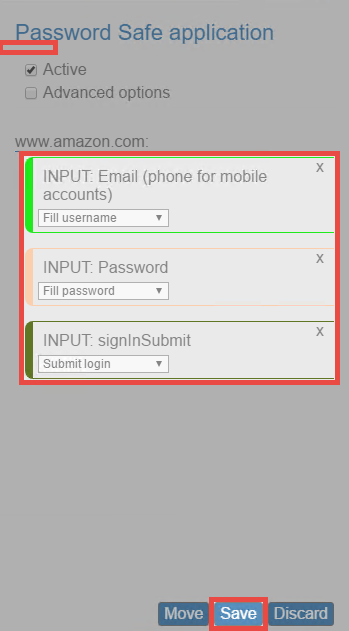 If the login mask on a website cannot be automatically completed, it is necessary to manually create an application. To create an application, the desired website is first called up. The add-on is then started via the relevant icon. The menu item “Create application* can be found here. A modal window now opens. The actual application is now created here. Advanced settings allows you to define a delay separately for each field when entering the data. This is sensible when the process of entering the data would otherwise not run smoothly on sluggish websites. To capture, click on the first field to be filled on the website. It will be directly added to the list in the modal window. For better identification, fields that belong together are marked in colour. The field type (e.g. INPUT) and the field label are displayed in the field itself. In addition, an action is proposed which fits the field type, such as e.g. entering the user name. The action can naturally be adjusted if required. Once all fields have been captured, the system checks whether the actions are correct. Finally, the application can be saved. The saved application is now available for the user and can be used via the add-on.